Medium brown color. Aromas and flavors of warm porridge, carrot peels, sautéed spinach, and wax with a supple, soft, finely carbonated, dry medium body and a smooth, fleeting finish imparting touches of hot cocoa, kale, jicama, and dusty earth finish. A mild, earthy stout. Bottom Line: A mild, earthy stout. Oatmeal stouts are brown to dark brown in color and range from 4-6% in alcohol. 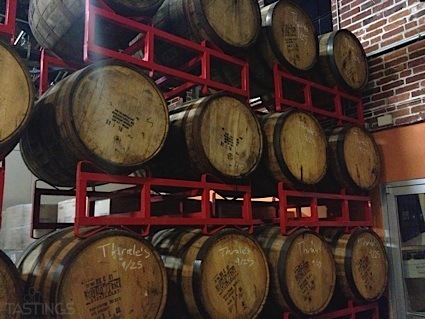 These beers tend to be highly flavorful with an occasional hint of sweetness. Oatmeal stouts are a twist on the sweet stout style with a portion of oats used in place of roasted malt, creating a rich velvety finish. The Yorkshire brewer, Samuel Smiths, revived this style around 1980 and it has since become a popular staple of the US craft-brewing scene. Noteworthy examples of this style include: McAuslan St. Ambroise Oatmeal Stout, Samuel Smiths Oatmeal Stout, Rogue Shakespeare Stout and Anderson Valley Barney Flats Oatmeal Stout. 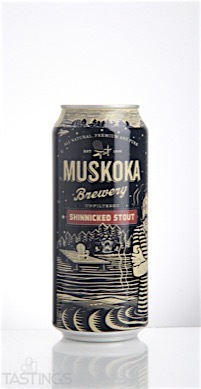 Muskoka Brewery Shinnicked Stout rating was calculated by tastings.com to be 80 points out of 100 on 11/28/2016. Please note that MSRP may have changed since the date of our review.